StopTTIP is the UK part of an international campaign to oppose the TTIP. The following information kit, about the US/EU Transatlantic Trade and Investment Partnership (TTIP), was compiled on behalf of StopTTIP campaign by Linda Kaucher. a) The US/EU Trade and Investment partnership (TTIP), called Transatlantic Free Trade Agreement (TAFTA) in the US, is a bilateral ‘trade’ agreement between the US and the EU. (The EU shifted from a primarily multilateral WTO focus to a bilateral agreement focus in 2005). The TTIP goes much further than any previous EU ‘trade’ agreement in deregulating, in establishing the rights of transnational corporations and in undermining the ability of governments to control corporations. It is set to completely change our society, and is already in process, as with the NHS. This agreement was formally launched at the G8 meeting in July 2013, but has been in process for much longer. The decision to launch the agreement supposedly involved waiting for a final report from a ‘High Level Working Group on Jobs and Growth’, though it was obvious that the recommendation would be for a free trade agreement. Although information about the ‘HLWGJG’ was not easily obtained, there was actually no membership list for this group and the ‘decisive’ report was just produced by the usual EU and US trade bureaucrats. The WTO Doha Round ground to a halt because in the context of the World Trade Organisation, developing countries were able to join together to resist the demands of western governments and the transnational corporate agenda. So in 2005 big business pushed the EU to change direction with its trade policy. Peter Mandelson was Trade Commissioner and the EU Trade Commission produced the Global Europe document, mostly a copy of a business lobby document, and the EU shifted to pursuing bilateral and regional trade agreements. The EU is now either considering, negotiating, or has completed free trade agreements with most countries of the world. b) In parallel to the transatlantic TTIP, there is a Trans Pacific Partnership agreement (TPP), with similar aims and inclusions to the TTIP. The US is party to both. The twelve countries in the TPP are Australia, Brunei, Chile, Canada, Japan, Malaysia, Mexico New Zealand, Singapore, Peru, Philippines, US, Vietnam. As at December 2013, the TPP could be finalised very soon, unless any of the 12 included countries reject it. c) ‘Trade’ and ‘international trade agreements’ are different. While most people would consider trade to be good thing, international trade agreements give rights to transnational corporations while reducing states’ rights to regulate them, thus reducing democracy. Tariffs on goods between the US and the EU are already minimal, so the TTIP won’t make much difference in that regard, though this the aspect ‘trade’ deal that is often emphasised. Trade-in-services liberalisations, talked about much less in relation to trade agreements, give corporations rights. The services categories, as defined by the WTO, are Business, Communication, Construction and Engineering, Distribution (includes food), Education, Environment (includes water, waste, nuclear waste), Financial, Health, Tourism and Travel, Recreation, Cultural, and Sporting, Transport and ‘Other’ – so it is a comprehensive list. The usual way of including services in trade agreements, including in WTO agreements, was by countries listing the services that wanted to include. This is ‘positive’ listing. However, the EU is now using ‘negative’ listing, including in the TTIP, whereby countries list the services they want excluded from the deal. This is much more encompassing and coercive. International trade agreements are for the benefit of transnational corporations. For the most part, domestic firms cannot use the provisions and do not benefit from them. In fact trade deals set the stage for domestic firms to be squeezed out by transnational firms, for instance on public procurement contracting. d) All free trade agreements include goods and services and intellectual property rights but the additional elements of the TTIP that are the main part of the agreement are much more far-reaching. These are regulatory harmonisation, investor state dispute settlement and the intention to establish global rules via these trade agreements. e) ‘Regulatory harmonisation’ means ‘harmonising’ regulation between the EU and US downwards to the most lax form, across all areas, to suit transnational corporations. This will mean the degrading of regulation on health and safety, food, environment, labour standards, privacy and much more, including financial services regulation. The NHS is now already ‘harmonised’ with the US corporate-access public health model. As this ‘trade ‘deal is a corporate agenda, regulatory harmonisation will clearly be in a downward direction, getting rid of what are called ‘trade irritants’ such as the EU’s bans on GM food, chlorinated chicken and hormone loaded beef’ and other higher EU health and safety standards. In another example, ‘harmonising’ our public service broadcasting model with that of the US will mean big changes to the BBC. State-owned enterprises are a particular, named target in this agreement. f) TTIP and TPP will also include Investor State Dispute Settlement (ISDS), allowing transnational corporations to sue governments directly for the loss of any future profits resulting from any government action, at any level, such as new legislation. Where ISDS is already included in ‘trade’ deals, it is shown to lead either to big pay-outs from governments to transnational corporations or to deter governments from legislating – the ‘chill’ effect. There are many examples around the world of where ISDS has had or is having these effects, for instance where environmental legislation has not gone through because of the threat of legal action. Canada failed to legislate for cleaner petrol, Germany is being sued for ending its nuclear power program, as is Australia for its cigarette plain packaging legislation. g) TTIP and the TPP are intended to set global ‘trade’ rules which will eventually become the norms for the multilateral WTO, but formulated outside of a structure that allows other countries to jointly resist the corporate-dominated agenda. The WTO Doha Round collapsed because within the WTO structure developing countries are able to join up to resist the western corporate-driven agenda. This TTIP/TPP mechanism for achieving globalised trade rules bypasses that possibility. h) As with all bilateral ‘trade’ agreements, TTIP and TPP negotiations and agreement texts are secret until the negotiations are completed. The European Parliament, the European Council, member state parliaments and the public cannot see the content of TTIP negotiations and texts so as EU citizens we are not able to know the commitments being made on our behalf, and on behalf of future generations until negotiating is finished. Yet business has privileged access to this information and to influencing negotiators to obtain what it wants from these deals. There is no justifiable reason for the secrecy because negotiators on both sides, as well as business, know what is on the negotiating table. The information is kept secret from the public, which might protest commitments being made on its behalf. i) International trade agreements are effectively permanent. International ‘trade’ agreements are intended to tie future governments into neoliberal deregulation whatever their political persuasion. What makes them effectively irreversible are Dispute Settlement Mechanisms, as in the WTO, whereby states can be challenged in relation to not keeping to their commitments, but much more so by Investor Protection Dispute Settlement whereby corporations can sue states directly for financial compensation. For ISDS, arbitration takes place in courts of the corporation’s choosing, outside of the legal framework of the host state, with arbitration panels that make decisions on the basis of ‘free trade’ rather than any other values. j) Although international ‘trade’ agreements are negotiated government-to-government (by the Trade Commission for EU member states), they are promoted and driven by transnational corporations, which benefit from states being bound by international trade law. The Commission’s ‘competency’ to negotiate international ‘trade’ deals on behalf of Member States was strengthened in the Lisbon Treaty, though this change was not part of the public debate on the Lisbon Treaty before it was passed and came into force. Transnational firms and industry organisations have a great deal of access to the Commission to dictate what they want from the Trade Commission’s negotiating. These include American lobbying organisations, such as the American Chamber of Commerce and US legal firms which, because of legal confidentiality, do not have to disclose on whose behalf they are lobbying. k) The main corporations are the same transnational financial service corporations that caused the global financial crisis. The City of London is the world’s main international financial services centre, with transnational banks and insurance corporations, the Big 4 accountancy firms and other financial service firms based there. The City of London has a major influence on the EU’s international ‘trade’ agreements. The power of the City of London Corporation and its front group, TheCityUK, in UK policy input into both EU internal and EU external trade policy, and in the formulation of UK domestic policy to fit with those broader ambitions, is only just now starting to emerge. The City of London Corporation has a dual role, as a Local Authority for the City square mile and also as the organisation promoting the interests of the financial services industry and channeling its demands to policymakers e.g. in both Houses of Parliament, in Brussels and at the World Trade Organisation (WTO). In 2010, the City of London Corporation joined with International Financial Services London (IFSL), which had been the financial services lobby organisation for a decade, to initiate ‘TheCityUK’ as the financial services lobby organisation. At that time, according to the website, there was a third partner, UK Trade and Industry (UKTI), a government department that straddles the Departments of Business, Innovation and Skills (BIS) and International Development (DfID). This showed government and business joined at the hip. However the overt involvement of UKTI was quickly removed from the website. Now, senior civil servants from the main departments of Treasury, BIS and others attend meetings as ‘observers’. Members of the committees of TheCityUK are from the biggest financial institutions and include individuals who have been main movers in deregulation and the liberalised international ‘trade’ agenda over the last 3 decades. Considering the power of the City, its role in dictating policy, and its £90m budget to influence policy and public perceptions, it attracts relatively little attention in the public sphere and this is even more the case for its lobby organisation, TheCityUK. One of TheCityUK’s committees is the Liberalisation of Trade in Services (LOTIS) committee, previously a committee of IFSL. In this committee, the existence of which was secret until uncovered by Non-Government Organisation World Development Movement, senior staff from major financial service organisations dictate UK input into EU trade policy to the UKTI bureaucrats who attend for this purpose. These bureaucrats then take that message directly to the fortnightly EU Trade Committee meetings of trade bureaucrats from all member states and the Trade Commission. In this process, transnational financial service firms direct UK input into EU international trade policy, bypassing the parliament, the public and potentially even the UK government. In Brussels, the European Services Forum (ESF), representing transnational corporations including US companies and working closely with TheCityUK, has privileged access to influence and direct EU trade negotiators, and to influence the European Parliament (EP) in respect of its role in ‘trade’, especially at the important committee stage via the EP’s International Trade committee (INTA). l) As part of the TTIP, a framework for the ongoing ‘harmonisation’ of all future regulation is being put in place with the setting up of a Regulatory Co-operation Council. This non-elected Council will be able to override national and EU legislating. This will make this a ’living agreement’ as the Trade Commission calls it, continuing to dominate government regulating into the future. It will allow for the fast completion of the TTIP because this committee will be in place to continue the regulatory harmonization process, for all existing and new regulation. The plan is also for business ‘stakeholders’, including from the partner country, to have a role in the preparation of all future regulation. So e.g. US corporations will have a say in all EU regulation and UK government regulation at the draft stage. m) ‘Public procurement’, that is all government spending, is a major target in the international trade agenda. Government spending is a big part of the global economy. ‘Public Procurement’, in trade terms, means transnational corporations gaining rights to access all government spending, including public services like the NHS. This part of the trade agenda is largely hidden. n) The TTIP is being rushed through, with the aim of completion by the end of 2014. There are specified ‘rounds’ of face-to-face negotiations, with the third round in mid Dec 2013. These are a focus for media, although the content is secret. However negotiations are actually continuous, some involving sections of negotiating teams and some by digital conferencing. o) TTIP will include provision for the movement of temporary workers across borders. This will inevitably mean cheap labour, and the undermining of working conditions and labour rights, especially in a context of overall degraded regulation. Most EU trade negotiations are with developing countries and its Mode 4 offers can be an important factor in getting countries to sign up to trade deals and to help them ‘sell’ the trade deals domestically. For instance, in the EU/India free trade agreement, negotiated for 5 years but now in an apparent lull, the single demand that the Indian government is making is for any Indian firm to be able to supply workers into the EU. Leaked documentation affirms that the UK is the main and willing target for this cheap labour supply, and WTO frameworks, which are used generally, do not allow any numerical limits or quotas on Mode 4. David Cameron has confirmed these conditions on his several visas to India as UK Prime Minister. Officials at the very top of the Trade Commission repeatedly lie about the EU’s Mode 4 offers, for instance pretending that the India deal is about the Intracorporate Transferee (ICT) Mode 4 category, that is workers moved across borders by transnational companies to work within the same company when the Indian government’s demand in this deal is for any Indian firm to supply skilled workers, a different Mode 4 category. The UK and the EU already have ICT commitments from 1995 under the GATS (General Agreement on Trade in Services) on ICTs – and this system is already abused in the UK. This secretive EU/India free trade agreement, involving almost a third of the world’s population (India + EU) still being negotiated and could be signed any time. Mode 4 will be a part of the TTIP. The US has withheld Mode 4 offers in its trade negotiating Instead it has a visa quota system for temporary skilled worker (H1B visas), a system that India has long tried to break through. Mode 4 offers in the TTIP will not just apply to EU and US forms supplying labour across borders, but also subsidiaries from third country firms established in either of those partner states, supplying workers into the other partner state. So, for instance, the many Indian corporations established in the UK would be able to utilise TTIP provision to supply workers into the US, or, if established in the US, to similarly supply workers here. Yet a main claim of the TTIP ‘spin’ is that it will create jobs on both sides of the Atlantic, as in the overused phrase ‘jobs and growth’. p) The Trade Commission has set up a special unit to attempt to control public perceptions of the TTIP. The Commission’s strategy document on this, produced for a meeting of member states representatives, has been leaked. Secrecy, spin and technical language are usually very effective in keeping the trade agenda out of the media and out of the public sphere. However this document acknowledges that there is unprecedented public interest in this agreement, requiring a spin strategy that is ‘radically different’ and tailored to individual Member States. The strategy is about trying to put across a proactive message of claimed benefits and to avoid being forced into a defensive position for instance on regulatory degradation and ISDS, and also to ‘reassure’ third countries, particularly China (indicating there must be unease about the TTIP agreement in third countries). The point is made that the co-operation of member state government propaganda machines is essential to this. This means we are paying even more to be targeted by ‘trade’ propaganda. There are observable signs of this radical strategy being enacted, including in the UK. One aspect appears to be a seeming climb down from an absolute hard line ‘free trade’ agenda, with some minor concessions (e.g. the reconsideration of UK plain packaging legislation) in order to manipulate public opinion for the big prize of the agreement. UK Trade and Industry, the government department that liaises between the Corporation of London and the EU Trade Commission to ensure that the financial services industry gets the trade agenda it demands, is also now placing large ads in newspaper, paid for from the public purse, to obliquely promote the benefits international trade. q) Once TTIP negotiations are completed, the European Parliament will only have the right to say yes or no to the agreement, with no amending. It will then, as with all EU ‘trade’ agreements, be provisionally implemented before it comes to member state parliaments for ratification. The European Parliament can hardly be an effective democratic mechanism when so few people know who their MEPs are and know even less how they vote. Aside from that systemic failing, the European Parliament has limited powers. And in regard to trade agreements, its power of assent on trade deals means that the Parliament can only vote for or against the deal, at that late stage. r) In the US, the government is seeking ‘Fast Track’ provision or Trade Promotion Authority (TPA) from the Congress. If granted, US representatives will similarly only be allowed to pass the agreement or not, without amendment. The vote on this is likely to be in January 2014 and opposition to it is growing. US trade deals have only ever gone through under Fast Track. s) The WTO is being used in an ongoing way to further the deregulation agenda. It is important to recognise that the WTO is subject to the same power plays of transnational corporate forces that dominate EU external trade policy, internal EU policy and UK national policy-making. Apart from the minimal part of the Doha Round agenda that was signed up in Bali in early December 2013, other important agreements are quietly proceeding within the WTO, without publicity. There is a grouping of some WTO members within the multilateral WTO who are signatories to a plurilateral Trade-in-Services agreement (the TiSA) for which the intention is to gradually coerce other countries to join, towards a global services agreement, a similar strategy as that intended for the TTIP and the TPP. There is a similar mechanism and intention for the plurilateral Global Procurement Agreement within the WTO structure. It is fair to say that the information, leaked about the Trans-Pacific Partnership and discussed in the video clip below, mirrors the terms, which are currently being negotiated in secret, for the EU-US Free Trade Agreement (also known as TAFTA or TTIP). Both deals are being fast-tracked by the Obama and UK governments – the push is for implementation by the end of 2014. Simply put, these Trade Agreements will remove all the bits of legislation aimed at protecting ordinary people and the environment. In free-trade-speak, these protections are known as ‘barriers to trade’… and that says it all. The Top Secret Trade Deal starts at about 13 minutes, after a harrowing preview of ‘Unmanned: America’s Drone Wars. Bill Moyers discusses the Trans-Pacific Partnership with journalist Yves Smith and economist Dean Baker, then a preview of filmmaker Robert Greenwald’s new documentary Unmanned: America’s Drone Wars. Also a Bill Moyers essay on Obamacare’s rocky rollout. It is often difficult to understand the economic-speak into which so many expert-explanations seem to lapse. I imagine that I am not alone so I will share a version of the explanations that make sense to me. Unfortunately, I no longer remember everyone that I should credit.. apologies. This generates an extremely useful word confusion because we all know the consequences of households getting into more debt than they can afford. In the absence of a real analogy, ordinary people are easily persuaded that government must cut ‘spending’ which of course is the ultimate ideological goal of the tea-party Tory neofeudalists. The deception that arises from the deficit myth is that the government ‘spending’ more than it receives in tax is detrimental and holds back economic recovery – hence the argument for the cuts and austerity. In order to understand why the deficit fears are just hype, it is helpful to look at how money and tax have historically been used to control and direct the behavior of populations. For example, British Colonialism in South Africa. Essentially, the motivation for invading and colonising a foreign country is about land – new land for settlement, agriculture and to exploit the foreign country’s natural resources. All of these require a substantial labour force. Obviously, the colonialists could have tried to import all the necessary workers (as the US has done) but the most practical quick solution was to use the indigenous population. The problem was how to get the indigenous population to plough the fields or go down the mines to dig for gold. Why would people, who had been living and surviving perfectly well for generations, want to give up their way of life to work for the colonialists? Not only was the work demanding and uncongenial but their own self-sufficiency would be threatened. Offer high wages… not only would that be beside the point of colonising in the first place but (initially at least) money would only be an inducement if it could be spent on some stuff or service that the indigenous population wanted or needed. No-one can eat bank notes. Enslave the population and force them to work at gunpoint … but that in itself is quite labour intensive, requiring guards as gang masters, and generally incurs an inconveniently high mortality rate (as in the Belgium Congo). The third option is much simpler…. create a currency and require the indigenous population to pay tax in that currency. Warren Mosler has a neat routine which explains how taxing works. He tells the audience that he is turning his business cards into a currency and that he will pay each of them, one business card, to clean the lecture theatre at the end of his talk. The audience laugh until Warren Mosler adds that there will be armed guards at all the exits who will only allow individuals out of the lecture theatre if they pay a tax of one Mosler business card. So now the audience has the choice of being trapped in the lecture theatre all night, or do the cleaning, get their business card ‘pay’ and be allowed to go home. So by creating a Business card currency and enforcing ‘tax’ collection, Warren Mosler is able to control and direct the behavior of the audience. The same system held in inducing the indigenous population to work for the colonists. Those who failed to pay their taxes were imprisoned and could then be used as unpaid forced labour. Either which way, the indigenous population were snookered. The Colonial and Mosler ‘governments’ had to ‘spend’ before the workers could pay their taxes. Futhermore, the tax that was collected was quite irrelevant in determining how much the Colonial/Mosler ‘governments’ could spend. If they needed more labourers, they just created more money. The tax was not government income in the household sense. The tax was simply part of the mechanism to get the work done and make the money flow. In fact, after collecting, the tax receipts/business cards could just be thrown away .. the only cost would be the cost incurred in the actual manufacture of the bank notes/business cards. Now in the Mosler currency system, the amount of tax received back would equal the amount that his ‘government’ created.. so there would be no ‘deficit’. However, if someone wanted to ‘save’ a Mosler card memento more than they wanted to go home… there would be a ‘deficit’ of one Mosler business card collected in ‘tax’. Nevertheless, the deficit would not be any problem to the economic system. Warren would still have got the Lecture Theatre cleaned, he could print another set of business cards whenever he needed to, and the Mosler business card collector would have ‘saved’ his card to spend at a later date. Essentially, the ‘deficit’ is a reflection of the total amount of saving, investment and employment that is occurring in the economy. It is not something which has to be paid back. ‘It is the non-government sector deciding to save more than it invests that generates the government deficit’ (Neil Wilson cif). The driving force of the slump remains the fall in investment, led by the fall in business investment. The fall in business investment alone more than accounts for the entirety of the prolonged crisis. Government could act to offset this by investing on its own account, if necessary drawing on the resources of the private sector to do so. Instead, the Coalition cut public sector investment by £6bn after Labour increased it modestly…. It is still the case that increased public sector investment is the only viable means of resolving the crisis that doesn’t lead to further misery for the majority of the population. Why is it so difficult for people to connect the dots… When money is injected into the economy it bounces around generating transactions and taxation. Anything left is saved by somebody and eventually ends up being swapped for Gilts. Government spending pays for itself. Each time every time. 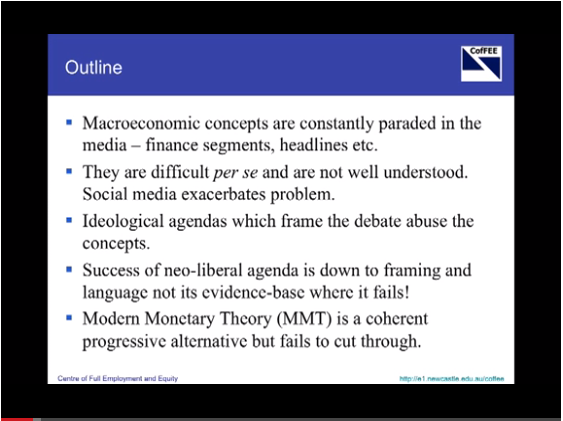 … the constraints imposed by neo-liberalism are entirely ideological and came about from a concerted campaign to win the battle of ideas. There is nothing about deficits that should frighten international capital. In fact, capitalists will make higher profits in a fully employed economy than in a stagnant economy. The question of inflation also does need to be answered. No economist, including Warren Mosler and Bill Mitchell, would say that the deficit didn’t matter. Although their argument is often deliberately misrepresented in that way. The argument at the moment should be that, as inflation isn’t the major issue at present, therefore the deficit isn’t the major issue either..
Its an argument which, as Bill Mitchell points out, doesn’t bother the more progressive of the capitalist class. They know they don’t make profits from low deficits if low deficits mean reduced business activity and higher unemployment. There’s no profit , or surplus value, to be made from an unemployed worker! I was trying to keep it simple. I did try working inflation into the Mosler business card model but it all got a bit surreal! I know that the OBR etc question that the UK has suffered a decline in capacity post 2008 but you know how iffy their predictions are.. and can’t see it being a problem when we need ‘a New green Deal’ to be zerocarbonbritain 2030!